UNDERCOVER WHEELS have been the leader in the aggressive wheel market for several years. Arguably the best PU compound available paired with a great team of world-class bladers as well as creative and colourful designs, UC have been the only brand that has actually kept growing during these hard years in a shrinking aggressive industry. 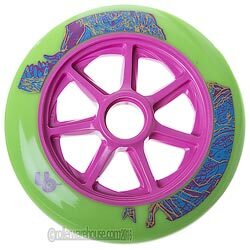 After the big success of our powerblading line, many freeskaters started to choose UC wheels over other more established and well-known brands from their world. Now, we’re ready for the next big step. UNDERCOVER will now team up with MATTER, the legendary leader of the racing and freeskating world to create the ultimate wheel brand. Both brands have combined forces to start a new era of blading meaning that the differences between all disciplines: aggressive, powerblading, freeskating, recreational and even fitness skating are disappearing, resulting in one big, united community of skaters. All our wheels are exclusively poured in California and they are created with the most durable, fast and grippy PU and the nest core compounds available in the industry. All proudly made in USA, Huntington Beach, the cradle of skating. From 55mm up to 125mm wheels, the UC by MATTER collection offers multiple choices of sizes, durometers, PU formulas, pro les and colours, covering all the needs of the MATTER followers as well as bringing new options such as the brand new 125mm wheels specially designed for the 3 wheel movement. It doesn’t matter what you do on your skates, whether it’s sliding, grinding, jumping or cruising, if you want the best quality there is only one choice: UC by MATTER, the ultimate wheel brand.